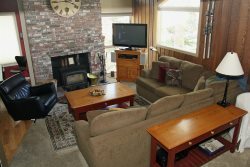 Very Nice 1 bedroom & Loft & 2 bath condo located in the heart of Mammoth Lakes on the green line shuttle stop to the Eagle Lodge Ski Area. Sleeps up to 6 with approx. 1100 sq. feet of living space. You enter the unit from one flight of outside stairs and then the first floor is the living room, kitchen, dining room, bedroom and 1 bath...the 2nd floor is the loft and 1 bath. The downstairs bedroom has one King bed & 32 inch flat screen TV with blueray dvd. The loft has one Queen bed and one set of Bunk Beds and a 32 inch flat screen TV with blueray dvd. There is a 47 inch Flat Screen TV in the living room with blueray dvd. Wifi internet access is also included in the unit. There is one Queen sofa bed in the living room. Wood burning stove in the living room with remodeled rock work hearth. The dining area has a cd/ipod am/fm stereo and the bedroom & loft have ipod docking clock radios. Washer & Dryer in the unit. There is also additional storage space with bench and coat hooks under the stairs off the living room. Nice view of Mammoth Mountain. There are 2 outside parking spaces available. Jacuzzi and sauna on-site. Swimming pool available in the summer months only. Coin-operated laundry facilities located in the common area near the office. No Phone in the unit. COMPLIMENTARY INTERNET and CABLE TV are provided, however NO REFUNDS will be given for connectivity problems or Internet failure. TOT LICENSE 3390-WF36. Love the place... will definitely come back!washer/dryer in unit is a big plus!!! Our stay at this Wildflower Condo could not have been more perfect! We were able to cook, stay warm and enjoy family in a very easy and convenient way. When youre in Mammoth, places like this are exactly what I look for- a stress free experience! After a day of skiing or outdoor activities, you need a place thats comfortable and has clean and nice beds. We appreciated that the beds sheets were clean and the beds were hotel quality. We would book this condo again in a heart beat, thank you! Had an amazing weekend. Place is supper cozy and cute!!!! Loved this place! I was a bit nervous booking a cabin for the first time in mammoth for a trip with friends but this place was so home-like and exactly what I thought itd be! Very clean and comfortable. Host was also quick to respond and help us when we accidentally left our cooler there during check-out. Thanks so much for being so accommodating! Very accommodating hosts. Easy check in/ and out. Highly recommend for an family. Had a great Christmas there, best Christmas in years! I cannot find any complaint, thanks! Great place very clean it had all the things we needed. There was plastic sleds and a snowbard we could use. It was decorated in typical cabin style it was very cozy. Very nice place and close to all amenities in town. Overall very nice place- we had a wonderful family vacation. Looking forward to our next vacation already. Just one suggestion- the loft upstairs gets really warm at night making it hard to sleep for some . We cranked open the window, but it was still very warm. Perhaps a small fan may help keep the loft cool. The team was great and extremely helpful in accommodating our stay. Super responsive. Loved that there was a TV in every room and also had the fastest internet than any other places weve stayed in at Mammoth. Hands down! This was one of the best cabins Ive stayed at. Very roomy and its location was perfect. Everything is in walking distance but I was too lazy so I drove everywhere :) key pick up was very easy and communication with the host was great. Beautiful home and there were so many heaters to keep us warm. 10/10 would recommend. Awesome place! Clean, comfortable and accommodating. Such a nice neighborhood with a good view of the mountains. Close to town and the shuttle is super close! Without a doubt will stay here again! Loved this place! I have zero complaints and will absolutely stay here on my future visits to Mammoth! Thank you for a warm, clean, cozy winter getaway! We got snowed in and Central Reservations of Mammoth was incredibly accommodating. The unit itself was everything we could have asked for and more. Loved this place! I have zero complaints and will absolutely stay here on my future visits to Mammoth! Thank you for a warm, clean, cozy winter getaway! Awesome place! Clean, comfortable and accommodating. Such a nice neighborhood with a good view of the mountains. Close to town and the shuttle is super close! Without a doubt will stay here again! Hi, our three generations stayed in Units #36 and #18. Both units worked out very well. We love Wildflowers location - within walking distance to several restaurants and the Lutheran Church, and the openness of the grounds. The pool is a great addition for kids young and old. Everything was great and we would definitely stay in those two units again.